The Mo Ibrahim Foundation annually awards the largest prize in the world to recognise and celebrate excellence in Africa leadership. On October 20th 2008, Festus Gontaebanye Mogae, former President of Botswana, was announced as the recipient of the 2008 Ibrahim Prize. The Commonwealth Business Council (CBC) in association with the Government of Rwanda, Rwanda Investment and Export Promoting Agency and the East African Business Council is proud to host the first annual East Africa International Business Forum (EAIBF) on the 29th and 30th of October 2008 in Kigali, Rwanda. HE Paul Kagame, President of Rwanda, along with the other four East African Community Heads of State, will host the forum. The theme of this event is 'Trade and Investment Opportunities: Growth through Global Partnerships'. It will focus upon new opportunities for investment partnerships across East Africa, including Rwanda, Kenya, Tanzania, Uganda and Burundi. Confirmed speakers already include HE Paul Kagame, President of Rwanda, Edward Marlow, Managing Director HSBC, Stephen Hayes, President of the Corporate Council on Africa, Omari Issa, Executive Director Investment Climate Facility in Tanzania and John Maguire CEO CRU Investment Management UK. The EAIBF will bring together more than 400 participants, including business leaders from East Africa, Europe, North America and Asia. Speakers and panellists will be made up of Heads of Government, Ministers of Finance, Ministers of Trade and Development, Chairs and Chief Executives of businesses, investment fund managers and other industry leaders to help identify the best investment opportunities in East Africa. The event will also provide unparalleled networking opportunities for all attendees; in addition to the main plenary session the event will have specific investors' roundtables covering power, transport, water, financial services, mining, agro processing, telecommunications, oil and gas and capital markets. The century of donations and other financial development aid seems to be over. Many African countries have a steady economic growth and captured the attention of the business world. Africa is proving to be a vibrant emerging market with a climate that fosters growth. Africa is thinking out of the box and is committed to be self-sufficient without the image of a third world continent. Africa is officially open for business and ready for take off. 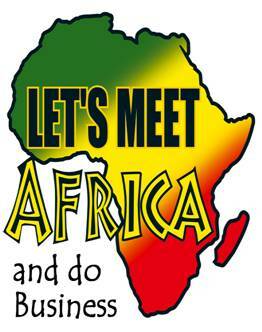 OAVM Organisation & Consultancy will organize in cooperation with the foundation Let's Meet Africa on 7 & 8 November 2008, a two-day exhibition in Eindhoven, Netherlands. Organisations and companies from the Netherlands, the rest from Europe, Africa and the rest of the world will be present. This is the place to present your company, its products and services to the African and European community. We welcome Exhibitor participation from all over the world, as it will enable you to bring to a open platform for foreign investor and to network with companies from Africa, the Netherlands and the rest of Europe. This year's forum will address the urgent issue of what the current generation of Africans can do now in order to participate in Africa's emergence as a global economic powerhouse, both in the African Diaspora and on the international stage. The 2008 WABF seeks to entice the emerging generation of young Africans who have been incited to action, motivated by the dawn of change, and are ready to act as a catalyst in realizing Africa's promise. ALL the above crowned with a night of life Music featuring: The Palaquins & Our Special Regae Star Guest!!! Ce congrès sera l'occasion pour les chercheurs et professionnels de la gestion des ressources humaines qui s'intéressent au continent africain de le découvrir et de mieux le connaître. Parallèlement aux activités scientifiques, des visites et ateliers d'échanges seront organisés pour vivre la réalité de la GRH dans les organisations et institutions de formation africaines et en discuter avec leurs dirigeants. Ce sera aussi l'occasion de nouer des contacts de partenariat avec les institutions universitaires et professionnels de la GRH en Afrique. 2008 Financial Law Academy, is an informative, practical and highly interactive programme that covers a wide range of legal and financial subjects such as PPP & project finance, environmental law and international lending. To assist those involved gain a greater understanding of the elements involved, Regal Exchange in association with the African Development Bank (ADB) and lending international law firms Sidley Austin, Norton Rose and Blake Lapthorn Tarlo Lyons, will host the 2008 Financial Law Academy between the 10th and 14th of November 2008 in Tunis, Tunisia. The financial law Academy will be a beneficial forum for participants seeking to navigate their ways through legal complexities that arise from international transactions. 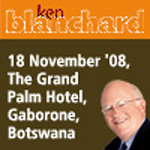 Ken Blanchard will present his latest insights and ideas on outstanding leadership and how good leaders and organizations become great - and stay great. This is a unique opportunity to treat yourself to Ken's outline of methods and processes on how to lead people to greatness by creating a high performing organizations. PricewaterhouseCoopers (PwC) is pleased to announce that it will hold its fourth annual International Development Conference on 20th November 2008. The event will be held at One Whitehall Place, London. The conference is being organised by PricewaterhouseCoopers in association with the British Institute for International and Comparative Law, Business Action for Africa, CDC Group, the Chartered Institute of Public Finance and Accountancy, the National School of Government and Tiri. The event will bring together over 180 public, private and voluntary sector practitioners who work with development aid agencies to improve governance in developing and transitioning countries, in addition to key stakeholders from recipient countries. The objectives of the conference are to draw lessons from the implementation of development programmes, identify areas where project delivery could be improved and strengthen networks across the different sectors and stakeholders working in the international development field. Speakers for the event will include practitioners with extensive first hand development experience, thought leaders on international development issues and senior policy makers. This conference will bring together Nigerians working in the health sector in the Diaspora including doctors, pharmacists, nurses etc as well as important stakeholders and our partners in the health arena who are based in the UK, to focus on the following objectives. 1. To create a forum where Nigerian professionals working in health roles in the UK and partners working on health issues in Nigeria meet with the Federal Ministry of Health and its partners to explore opportunities of working together for the benefit of the health of Nigerians. 2. To hear from senior government officials on their priorities for health and health care are as well as their strategies in confronting these in order to identify ways in supporting them in achieving these. 3. To identify and publicize the role of links, partnerships and research collaborations in improving the health of Nigerians. 3. Report and Track Strategy. Dr. Norton will highlight the necessary tools provided within the Balanced Scorecard model that will enable you to succeed in all three - in short, make your strategy happen. Fees: £895 per delegate - SAVINGS from £895 for groups of 5 or more. Discounts: Register and pay before 10 October and pay only £795 per delegate & receive Dr. Norton's latest book The Execution Premium (signed). In the wake of this new era in HR practices the 5th Annual HR Africa Summit is vastly becoming the platform for HR Executives, Practitioners and Directors across Africa to gather and share concerns, challenges and achievements in the HR world. Without a sound understanding of how business operates, what the concerns of your stakeholders are, and how to talk the business language, HR will retain a minor league status in a major league environment. The Commonwealth Business Council in association with CyberMedia will be holding the Africa Outsourcing Summit on the 27th and 28th of November at the Hilton Canary Wharf, in London. The Summit, the first and only one of its kind, will bring together over 200 participants from over 15 major African outsourcing destination countries together on a major platform in front of European companies that outsource systems and IT processes. A principal highlight of the Summit will be the release of a report on the first day entitled "Attractiveness of Africa as an Offshore IT/ITeS Outsourcing Destination". CBC & CyberMedia are compiling the report, which is based on our research into the key factors that affect outsourcing in Africa. The CBC has made Africa Outsourcing its main focus and is driving the agenda forward with this summit. We see Africa growing in strength, capacity and capability in the global business of outsourcing. We believe it will compliment countries already within the outsourcing sector, such as India, China and the Philippines and will bring its own diversity into the mix to make the sector even more attractive. This training workshop aims to offer delegates the opportunity to transform their organisation an employer of choice. The training will reflect on important aspects of effective planning, and walk delegates through the different elements of the talent acquisition and retention processes. The second day of the training will reveal important drivers to develop talent and look at key aspects of creating effective career paths for the talented individuals. The course will also venture into the role of succession planning and will provide delegates with practical exercises to enable the creation of succession plans. Le journal Les Afriques s'adresse à l'ensemble des acteurs de l'économie africaine qui s'inscrivent dans la mondialisation et dans l'intégration économique du continent. Sa ligne éditoriale suscite l'adhésion de tous ceux qui préparent l'Afrique de demain. Online job portal www.findajobinafrica.com. A one stop job search engine for Africa connecting recruiters in Africa with jobseekers inside and outside Africa.